Is it a good time to set up shop in the UK? Despite popular belief, the answer seems to be a resounding “yes” – that is, if you’re a digital merchant. When it comes to localised ecommerce, the current state of the UK is indicative of shopping trends worldwide. The recent decline in UK retail sales spells worry for brick-and-mortar shops, especially high-end retailers who’ve become synonymous with London’s bustling shopping scene. Coupled with the fact that 51% of UK shoppers prefer to purchase products online, there’s a clear shift away from traditional retail. Oh, and there’s plenty of cash to go around, too. The UK’s online net sales spiked at the equivalent of $80 million USD in 2017, representing a 10% growth rate. This massive, growing market represents a window of opportunity for e-tailers. This is further signalled by industry moves such as BigCommerce’s expansion into London over the summer, with the ecommerce giant leveraging England’s capital city as a hub for its business development activity across Europe. But what are UK merchants doing right, anyhow? How is a region so well-known for its physical storefronts translating its success to the digital space? From big box brands to ecommerce-exclusive merchants, we’ve broken down how six totally different businesses are dominating the UK market. These companies all exemplify not only the best practices of ecommerce at large, but serve as inspiration for aspiring sellers in the region. 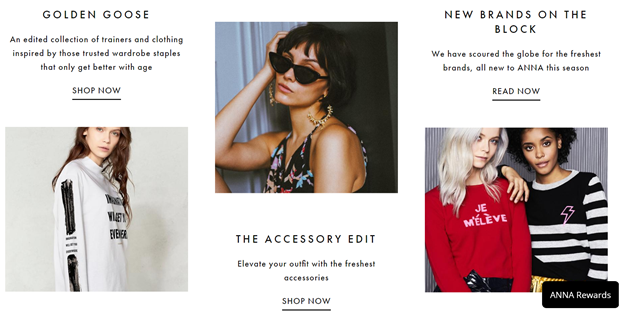 Even in the face of recent retail gloom and doom, Next has adapted brilliantly to the realm of ecommerce. 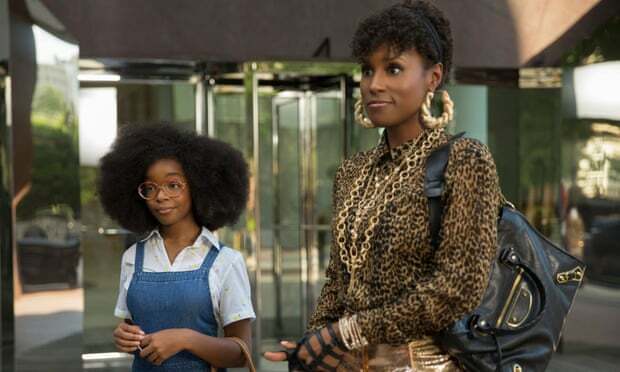 While their success may seem like a no-brainer given their reputation and existing reach, Next is taking specific steps to seem more authentic and down-to-earth like brands a fraction of their size. Yumi is yet another example of a UK success story that came as a result of migrating an existing storefront to the ecommerce frontier.According to the brand’s case study via BigCommerce, Yumi was able to adapt and grow their monthly revenue by 43% by emphasising speed and the ability to rapidly roll out new products and deals. There’s a reason why so many existing brick and mortar stores are making the jump to an omni-channel presence. 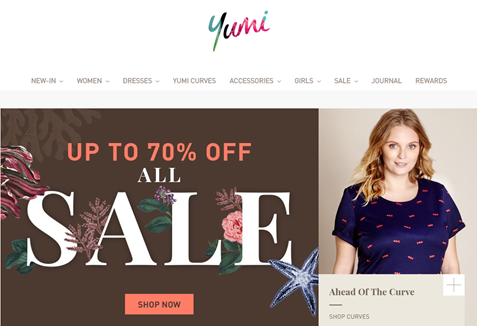 Although Yumi’s site obvious looks gorgeous at a glance, the back end of today’s ecommerce brand is arguably just as important when it comes to running a store that scores sales. As a brand, ANNA oozes authenticity. It’s slew of user-generated product photos and sleek, minimalist design set it apart from storefronts that are much more polished. The takeaway here is that presenting your products “in the wild” and adopting a “less is more” mentality is totally fair game for brands today. In other words, sometimes carving out your niche means not taking traditional route brand-wise. That said, the site does tick all of the boxes of a top-tier ecommerce store between recommended products, highlighted top sellers and a bustling company blog. 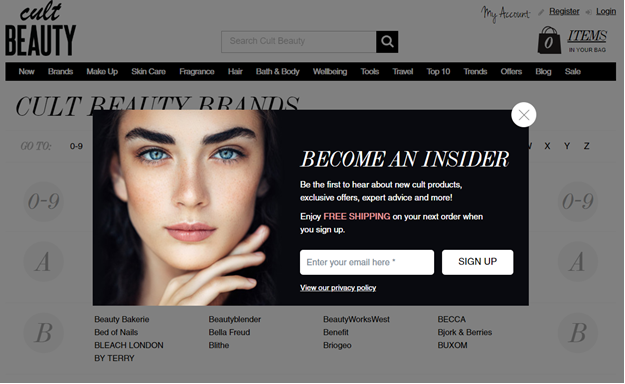 As soon as you land on the brand’s homepage, you’ll notice that Cult Beauty isn’t shy about pushing offers, deals and opportunities to opt-in to their email list. While some may see this approach as pushy at a glance, it’s more effective than you might think. In fact, the average email ecommerce email campaign in the UK is worth $380 USD, representing a striking reminder of just how deal-hungry today’s consumers are. From the word“go,” the site signals to visitors that they shouldn’t have to pay full price if they can help it. Additionally, Cult Beauty goes out of their way to drive home best-sellers and featured products to encourage visitors to take action rather than potentially bounce. The more straightforward you make the buyer’s journey, the better. Spoiler alert: not all ecommerce giants in the UK started in the region. Take Dollar Shave Club as a prime example, recently entering the cutthroat UK razor market while competing against the likes of Harry’s and Cornerstones. 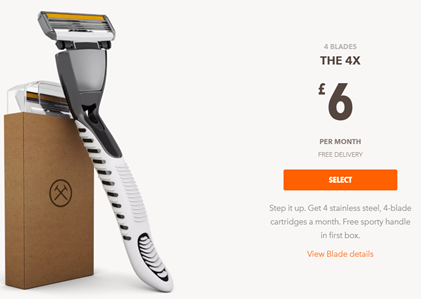 Dollar Shave Club’s UK ecommerce push is a clear example of not only how stiff the competition is becoming, but also how going the extra mile in terms of content is always worth it. Dollar Shave Club boasts sleek photos, rich product descriptions and brilliant UX to help shoppers make their decisions. What’s notable is also what they do off-site, including their slew of successful Facebook ads which have rightfully become cornerstones of ecommerce today as well. Another legacy brand on the list, 150-year-old Sainsbury’s could easily fall prey to the trap of having a rather “ordinary” ecommerce presence, given their existing reputation. 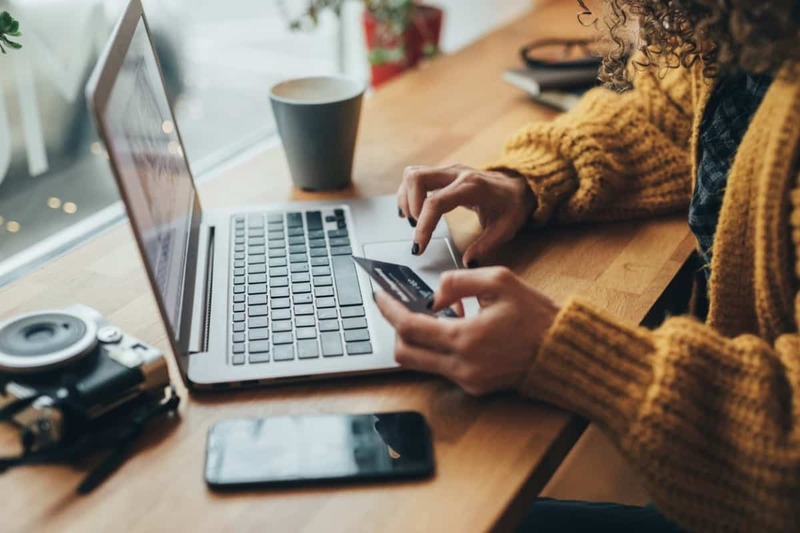 Instead, they go out of their way to position their online storefront as the ultimate place for deal-hunters, highlighting their latest and steepest discounts upfront. 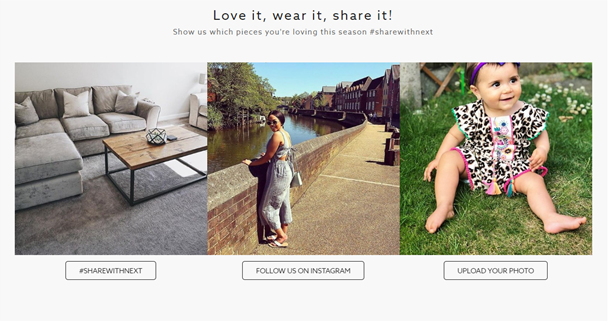 Another notable aspect of Sainsbury’s is their social presence, specifically their Instagram. Many big retailers struggle when it comes to social despite the fact that one-in-four consumers actively follow their favourite brands. To remedy this, Sainsbury’s Instagram serves as a hub for educational and inspiration. 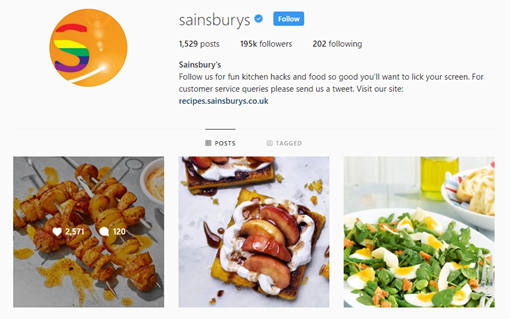 Presenting themselves as a helpful lifestyle-oriented resource rather than a faceless corporation, Sainsbury’s Instagram is brimming with eye-popping imagery, “inspro” pics and recipes that followers can adapt for themselves. This organic, educational approach to social selling is a far cry from simply pushing deals or begging for engagement. What’s Next for Ecommerce in the UK? The ecommerce space is constantly evolving, and UK-based merchants are clearly at the forefront of the ever-growing shift in retail. As evidenced by our list, there is no “one” right way to run your ecommerce store in the UK. In fact, the options and opportunities are quite endless. Given the features and functionalities today available for brands both big and small, the online landscape is surprisingly bright in the midst of so much economic uncertainty. Despite the problems plaguing brick-and-mortar stores at large, there’s no denying that ecommerce is not a passing trend: an omni-channel presence should therefore be a matter of “when,” not if for UK retailers moving forward. Next PostAre your company mobile phones a data breach waiting to happen?